Casanova eyewear conquered the optician market almost overnight. 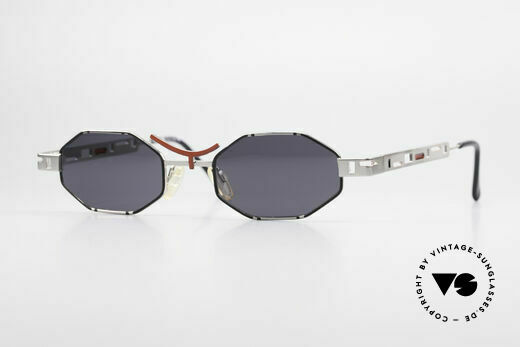 Suddenly, in the early 1980s, eyewear models appeared that were more of an art object than a reading aid. 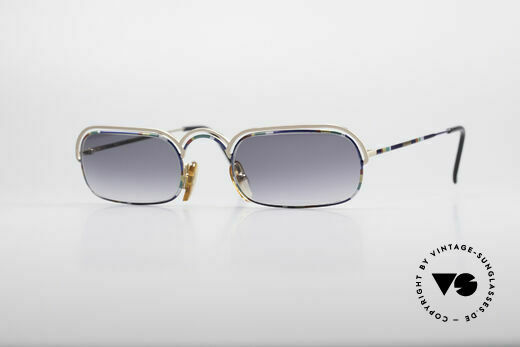 One Italian eyewear manufacturer from Venice designed frames that had been inspired by the exuberance and joie de vivre of the Venetian carnival. 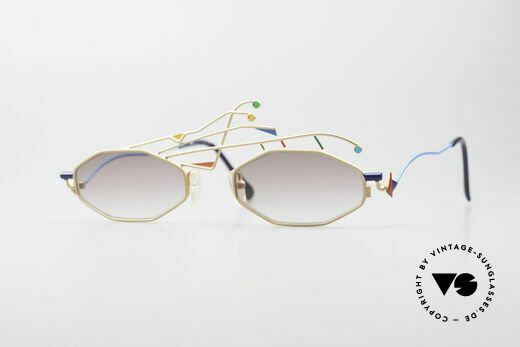 Named after the Italian writer and adventurer Giacomo Casanova, the frames were correspondingly ingenious and colorful. There were, for example, Casanova glasses with a small fool's cap or Casanova “Paradise Glasses” which incorporated the symbols of paradise (snake, apple and fig leaf). These imaginative vintage glasses were real objets d’art and quickly became collectors' items. Their collector status was further reinforced by the fact that one Casanova vintage model was produced only as a very limited edition. The models in the Casanova Arché series were limited to 300 pieces worldwide. Each pair of glasses came with a serial number and its own corresponding certificate. In ancient philosophy, Arché (ancient Greek for “beginning or origin”) represented the reason and the principle for the existing. 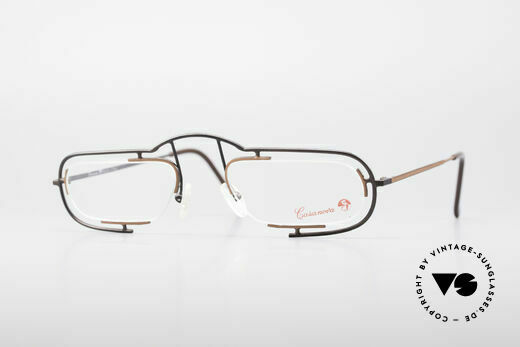 This cultivated approach was the claim made by the Casanova Arché eyewear collection. In addition to the Arché, there was another highly sophisticated series of glasses from Casanova: the Simbolismo. The design of the Simbolismo-Casanova glasses referred to the Symbolistic Manifesto. The essential characteristic behind Symbolist art is that an idea is never conceptually fixed. The models in the Casanova Simbolismo range seem to be in constant motion. The “Orientation” model is imprinted with the four cardinal points, the “Evolution” model shows a figure climbing a staircase and the “Standstill of Time” model depicts a person trying in vain to stop time. All these frames are numbered and provided with a certificate of authenticity. 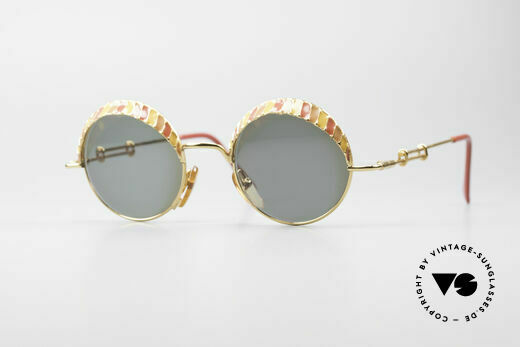 The artists behind the Casanova eyewear must have gone to work with the same cheerfulness, lightheartedness and boundlessness as at the wedding of the Venetian carnival, because the intellectual claim, in combination with luxury attributes, proved not to be economically viable (some Casanova glasses were 24kt gold plated). As a result, the old Casanova glasses disappeared from the optician market just as quickly as they had come. 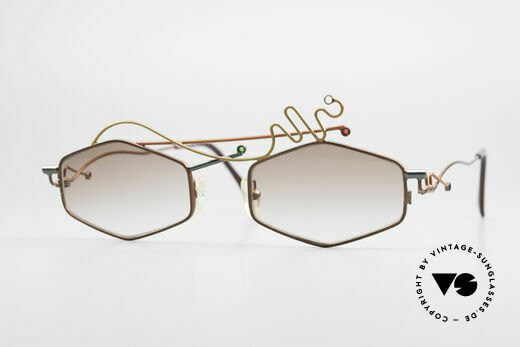 What has remained is unique art eyewear which has now a high collector's value. colorful design & peppy frame construction; unique! so, the 'jester hat' is attached to the frame; just fancy! "red" = Don't talk to me! "green" = You can talk to me.